Emergency room doctors and nurses work in high-pressure and often chaotic circumstances. They must act quickly to determine the nature of an individual patient’s emergency and to provide appropriate medical care. It is easier for medical mistakes to happen in this type of environment than in other medical settings; however, emergency room doctors and nurses may still be liable for medical malpractice if they fail to provide the same standard of care that a reasonable doctor or nurse would’ve provided under similar circumstances. Additionally, a hospital may be liable for medical malpractice damages if the hospital’s policies resulted in the medical malpractice injury. The doctor or nurse is tired. Emergency room staff often work long shifts and may be too fatigued to provide reasonable care. The doctor or nurse failed to obtain a medical history. This could result in a dangerous drug interaction or the failure to consider certain factors relevant to diagnosis or treatment. The doctor or nurse failed to warn the patients about potential risks of treatment. This prevents patients from making informed choices about their care. The doctor or nurse was distracted or otherwise negligent. An injury can result anytime a doctor or nurse fails to provide the reasonable care that another doctor or nurse would in similar circumstances. Failure to diagnose or a delay in providing a diagnosis. Releasing a patient too soon. It is not your job to prevent emergency room mistakes. You count on the hospital, doctors, nurses and other staff to provide you with reasonable care—that’s why you are there. However, if you find yourself in an emergency room for your own care, or for your loved one, then you should be aware of the risks presented by emergency room malpractice and you should know how to advocate for yourself or your loved one. What specific tests are you taking me for and why? How will the medication you are putting in my IV interact with the other medications I take? Have you ruled out any medical conditions? How? What tests or other information are you relying on for this diagnosis? Am I being admitted to the hospital? Why or why not? Additionally, before you are discharged from the hospital you should understand what follow-up care you may need. See a doctor whom you trust for a diagnosis. That way you can get help for your injuries. Follow your doctor’s treatment plan. This is important both to your physical recovery and to your legal recovery. Keep all medical records and write down all of your recollections of the emergency room visit. In order to recover damages you are going to need evidence. Meet with an experienced medical malpractice lawyer to discuss your legal options. Medical malpractice cases are difficult, but it is possible to recover fair damages if you’ve been hurt. You have suffered enough. 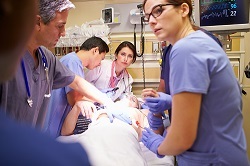 You do not need to deal with the stress of your own emergency room medical malpractice claim. Instead, we encourage you to contact the experienced lawyers of Gray & White Law at any time to schedule your own free, no obligation consultation. We would be pleased to advise you of your rights and legal options. Posted on 05/20/2016 When Is a Medication Error Considered Medical Malpractice? Posted on 04/13/2015 What Happens When a Kentucky Doctor Makes a Wrong Diagnosis?